The weekend for us — since you didn't ask — was an especially busy one. We helped Saturday at a promotional event for Music & Arts Week, attended a birthday party and went to see a local production of "Wicked" at the Birmingham-Jefferson Civic Center. The show was predictably fantastic, even if the crowd turned out to be a nightmare (we inadvertently bought tickets for the show on the same night as Jimmy Buffett's concert at the same site). By the way, while we're here, my wife has a note about theater etiquette: Specifically, if you spent the money that's required to buy tickets to a play (not BCS Title game expensive, but not cheap either) and took the time to dress yourself and fight the crowd to get there ... let's just say, you should probably put your cell phone away, sit up straight and bear it. Because you don't want an angry redhead bringing her wrath down on you midway through the second act. — The biggest moment of the weekend, naturally, goes to the men's basketball team, which continued its hot streak with a thumping of Mississippi State Saturday night in Coleman Coliseum. There's very little I can say about our team that hasn't already been said, so let me, for a moment, address State, if only because I watched them Saturday and Tuesday (when they lost at home to Kentucky). The Bullies have what is most likely the best 4-5 combination in the conference with Sidney and Moultrie ... only neither seems to totally want it. Sidney takes at least half the team's possessions off — just stands around the foul line or three-point line, watching everyone else play. And Moultrie is highly skilled, but Alabama covered him most of Saturday night with a guard (Rodney Cooper) and got away with it. That shouldn't happen. As for our team, we now have to take care of business at home Wednesday vs. Auburn — not a gimme, and if you think it is, remember how this game ended last year — to be assured of a winning record in conference play (not to mention 20 wins). I can't see how we get left out of the Dance if that happens. Which would be a remarkable accomplishment, and proof that Anthony Grant, like Nick Saban, is putting on a leadership clinic. 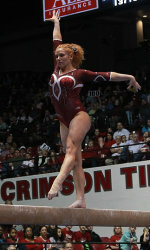 — Speaking of clinics, Alabama's gymnasts did what they do this weekend as well. You can see the squad's rankings here. — The baseball team also made some positive waves over the weekend, scoring 30 runs in a sweep of Arkansas-Pine Bluff. That's not exactly championship caliber competition (I don't think), but it was important to have some good things happen after the opening weekend debacle. Midweek games vs. South Alabama and Southern Miss this week should be notable, if only to see which direction we're headed at this point. — Remember when the NFL Combine really didn't matter to folks around here (because nobody we cared about was involved)? Well, those days are long gone, and here's a bevy of stories to prove it. First up, RBR's NFL Draft Combine roundup, detailing some of the struggles of Marquis Maze, for one. Also, Pro Football Weekly talked to Trent Richardson, which is neat just to type. On the defensive side, the pro football world is learning what most of us already knew: that Alabama's defenders are a versatile lot. Additionally, the state may have an answer for the NFL's defensive back deficiency. — A few other links, just to round it out: Thamel dreams up an acceptable NCAA playoff format; Freddie Freeman shoots for a Golden Glove and a batting title; and Drew live blogs the Oscars with a lot of ALL CAPS and most NSFW language (that means don't click here, Mom).